The facility has been designed to simulate a typical service and repair workshop found commonly within the industry. All equipment enables best training practice and the training facility is aligned to industry leading companies such as PPG, Dupont and 3M. Manual and fully automated machines for servicing repair, diagnostic and refilling of A/C units. All trainers are A/C licensed. The latest environmental and safety standard vacuum extraction system for sanding. State-of-the-art modern tuning machine, with integrated ignition and engine management systems. Diagnostics module for testing onboard computer systems. The hand-held device can be linked wirelessly to the PC system. Ideally designed for optimum educational purposes featuring the latest state-of-the-art welders. The latest fully automated technology for paint curing. It is the most efficient way to cure paint and has become a leader in the industry. A universal collision repair system, this fully digital, chassis alignment and measuring unit is used for major structural repairs. A high-end 3D unit is industry-leading technology that eliminates the guesswork associated with wheel aligning. 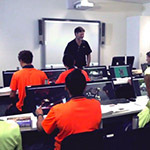 Latest technology exposing learners to industry standard machines, with large screens for added training benefits. Free parking in the facilities grounds and a fully equipped kitchen and lunchroom with outdoor dining area and BBQ. The facility has been designed to optimise environmental protection and safety. 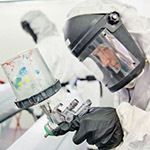 Latest technology in both solvent based and waterborne paint mixing and spraying. Equipped with electronic whiteboards, projection cameras and a computer lab training room ideal for theory-based training.